Barnegat Bay is a small brackish arm of the Atlantic Ocean, approximately 42 miles (67.2 km) long, along the coast of Ocean County, New Jersey in the United States. It is separated from the Atlantic by a long barrier island, as well as by the north end of Long Beach Island. 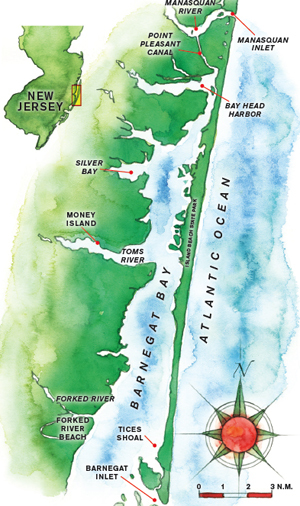 The bay is fed by several small rivers, including the Toms River and Metedeconk River, which empty into the bay through small estuaries along its inner shore. The communities of Toms River, Silverton, and Forked River sit along the river estuaries on the bay. The bay is entered from the ocean through the Barnegat Inlet, along which sits the Barnegat Lighthouse. The bay is part of the Atlantic Intracoastal Waterway, entered on its north end by the Point Pleasant Canal and connecting on the south end with Little Egg Harbor via the small Manahawkin Bay. In a broader sense, the bay is sometimes considered to stretch to the south end of Long Beach Island and to include Little Egg Harbor. The area surrounding the Barnegat Bay and Barnegat Bay Inlet were described by Henry Hudson, in 1609, as “…a great lake of water, as we could judge it to be … The mouth of the lake hath many shoals, and the sea breaketh on them as it is cast out of the mouth of it.” The bay was originally named in 1614 “Barendegat,” or “Inlet of the Breakers,” by Dutch settlers, referring to the waterway’s turbulent channel. During the American Revolutionary War, the bay was used as a refuge by American privateers. Three bridges span the bay from the mainland to the peninsula: the Mantoloking Bridge from Brick Township toMantoloking and the Thomas A. Mathis and J. Stanley Tunney Bridges from Toms River to Ortley Beach. The Barnegat Division of Edwin B. Forsythe National Wildlife Refuge comprises wetlands along the inner southern part of the bay. Along the outside of the bay, on the peninsula, is the Island Beach State Park. Various islands within the bay are a part of the Sedge Islands State Wildlife Management Area or Edwin B. Forsythe National Wildlife Refuge. On the northern tip of Long Beach Island includes the Barnegat Lighthouse State Park. The bay has been a longtime center for commercial fishing. The village of Toms River was a significant whaling port in the 19th century. While still popular for fishing, Barnegat Bay has also become a popular destination for recreational boating.Sailboats have been racing on Barnegat Bay since 1871. Toms River YC hosts the Challenge Cup a sailing trophy that has been raced for every summer since 1871. All races have been on the Barnegat Bay. Sailboat racing is very popular with ocean breezes and the flat water of the shallow bay. The bay is a great area for small racing craft.